It has always been a dream of mine to have a home theater so in our basement we reserved a small room for just that. The room was a rectangle and just big enough for two rows of seating. But in order to make sure the back row could see over the front row we needed to elevate that row with a riser. If you love this stuff as much as we do, you might want to consider following us on Instagram where we post sneak peeks and behind the scenes clips in our stories. Also, did you know you can get tons of projects plans from all around the web when you follow us on Facebook and Pinterest! In any theater, if you have one row behind another, you will need to elevate that row so that the viewer can see the full screen. Depending on the height of the first row and the distance of the screen from the ground, you’ll need somewhere between 7″ and 16″ of additional height. 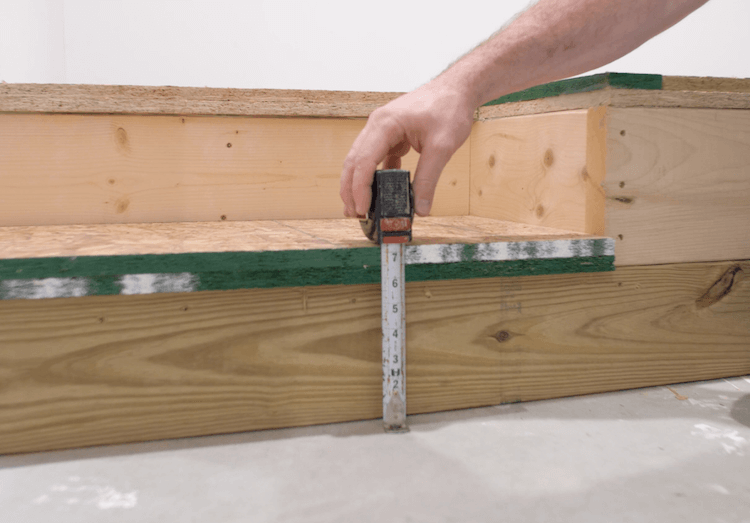 This tutorial will show you how to build an approximately 14.25″ height home theater riser. 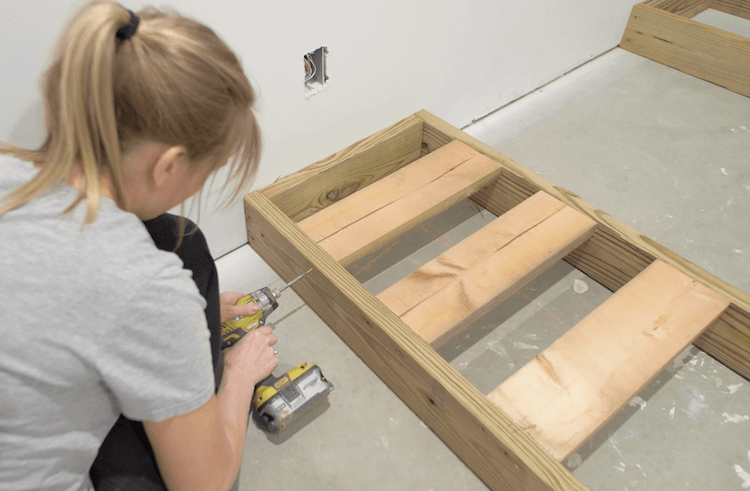 Two boxes are assembled with pressure treated 2x6s and 3″ wood screws. 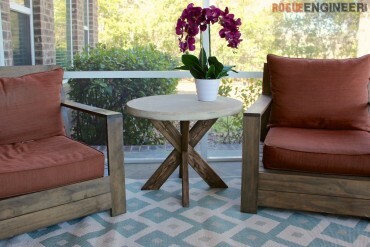 These smaller platforms are made out of treated lumber since they are in contact with concrete which may cause them to rot. The boxes should be about 16″ deep. 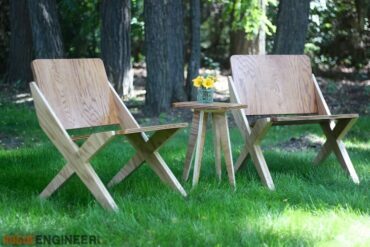 These will act like the beams of a deck so the closer they are together the better off you’ll be. Make the overall platform area is deep enough that you can fully recline your theater seating and still have room to walk in front of it. 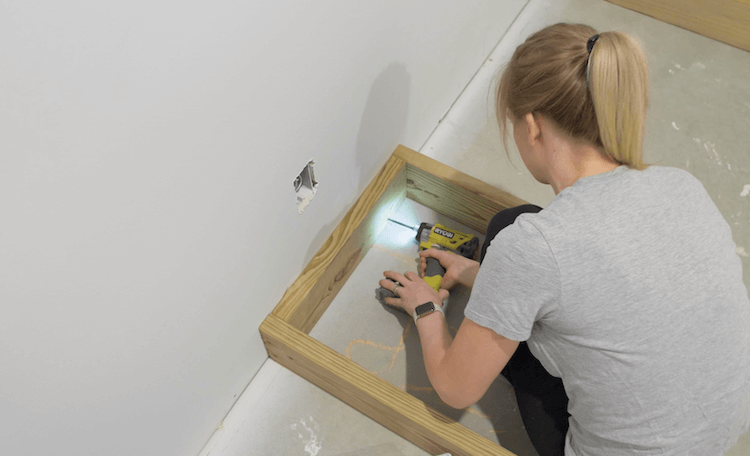 Then secure the bases to the wall studs with 3″ wood screws. If you plan to build the step into the platform like we did, now is the time to install blocking to support the step. We used 2×8 cut offs from the riser joists in step 2 and turned them sideways. 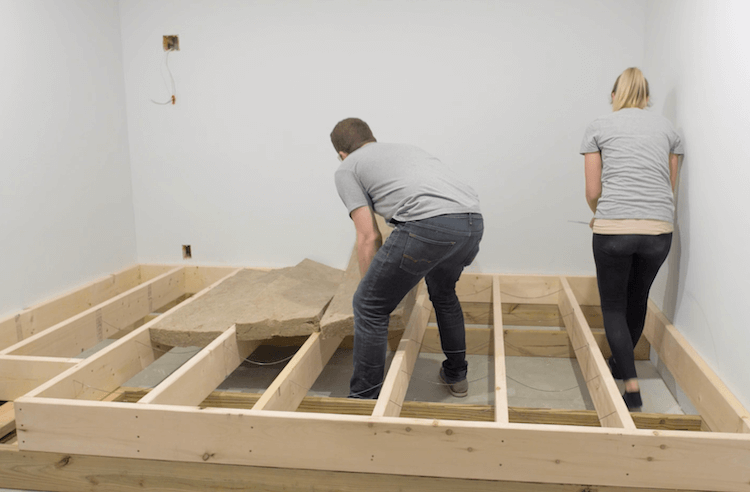 The joists are 2×8 untreated lumber and they are spaced 16″ apart. 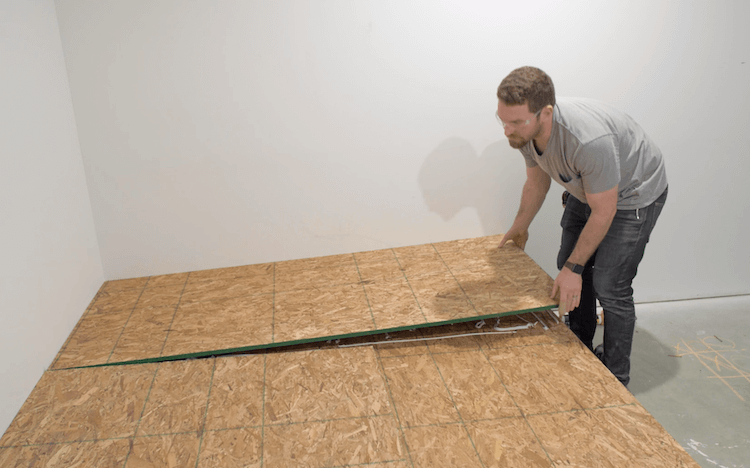 They get secured to the 2×8 rim board with 3″ wood screws. Then the joists and rim boards get secured to the lower platforms and wall studs wherever possible. As you can see I left a 2ft wide recess in my platform for the step. 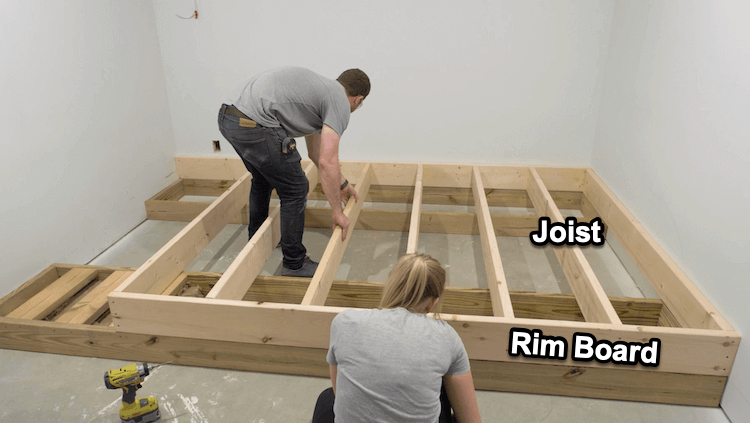 This meant that the rim joist on the front is cut short and the remaining piece is recessed about 14″ for a comfortable step. Since we have essentially created a big box, when it gets hit with something (like bass) it could act like a drum create unwanted noise, muddying the sound that you really want. In order to prevent this we are installing soundproofing mineral wool insulation to dampen any unwanted sounds that enter that box. The insulation is held close to the surface with 16″ insulation supports. 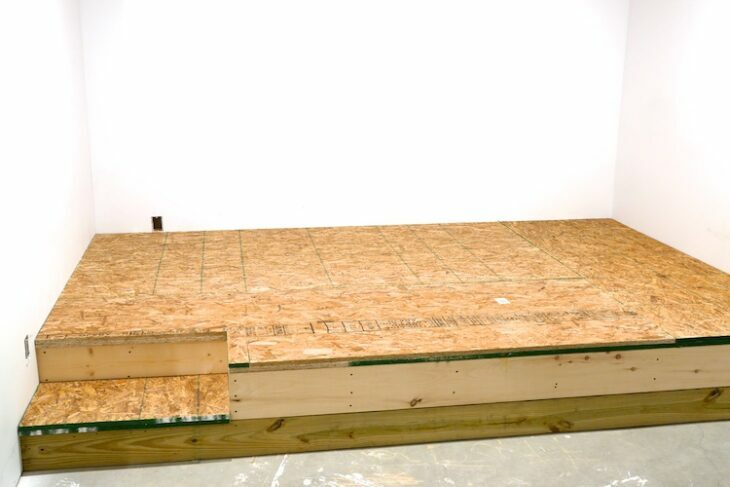 Now the 3/4″ OSB subfloor can be installed using subfloor adhesive or construction adhesive and wood screws. 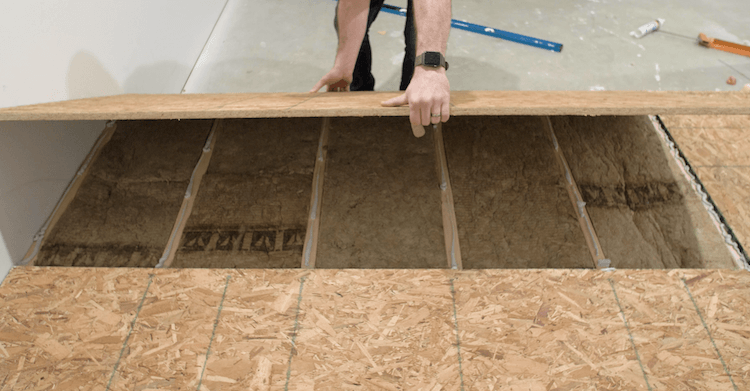 Make sure to cut the subfloor to size such that the end lands on the center of a joist. Then the end of the next piece can also sit on that joist. 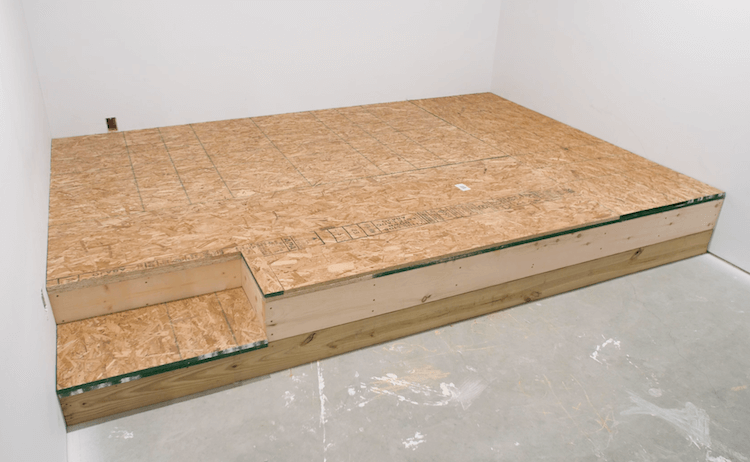 To stiffen up the platform and reduce vibrations, I glued and screwed down a second layer of subfloor with seams running in the opposite direction. 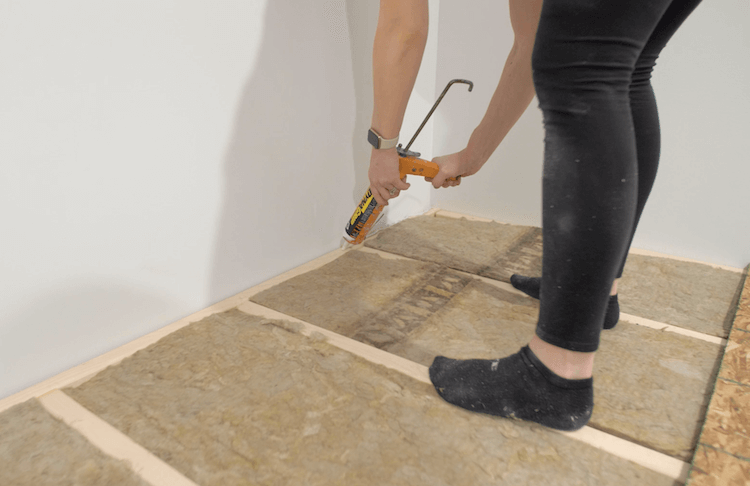 When cutting the subfloor at the step make sure to overhang the subfloor by 1″ on the front of both steps to create that step tread look. Now with the platform complete you can see why I chose the 2×6 base and 2×8 platform. 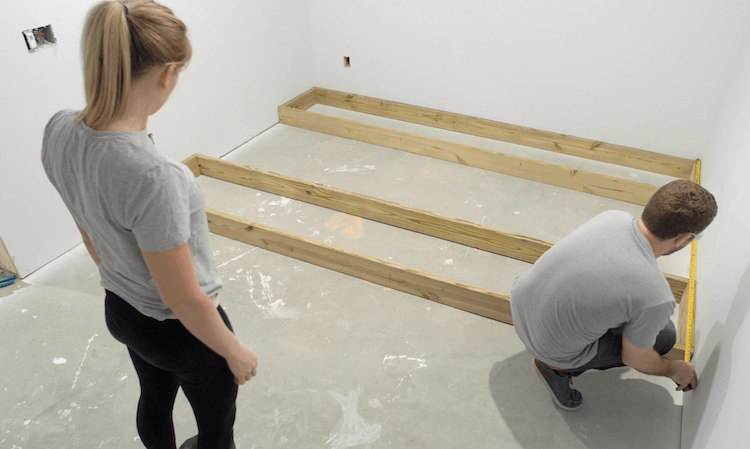 These two platforms allow us to create a near uniform step height very easily. 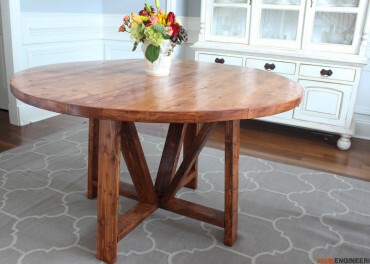 The first step is approximately 7″ and the second step is 7-1/4″. The next steps are carpeting and theater build out! I can’t wait to get started on that and will be sure to add links here when it is available.